After producing my "Great Cooks and Cookbooks" (collection of favorites from Justapinch) I still had a list of 25 cooks I wanted to add. 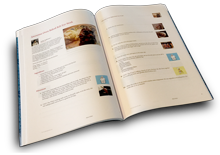 So I have made a new book: "Great Cooks II & Cookbooks". My shelves are heavy with old cookbooks, most are commercially produced and expensive. I prefer the little ones gathered by members of church,hospital auxilliary, and on those collected on vacation or by my mom. Here are recipes produced by contributors to Justapinch, and I hope I can live long enough to try the list of more than 700 recipes I've saved! Thanks for adding my Cod Fish Salad recipe!! Very nice cookbook. I saw a recipe for baked cabbage that I am going to try. I love cabbage but I have always done it fried. I use bacon grease instead of the oil or butter and red pepper flakes and its wonderful. Its nice to be able to try it from the oven instead. I love the cover...I have stacks of printed out recipes too! And yes, I hope I live long enough to make them all too! Thank you so much for including my recipes in your collection! Another great book Beth, thanks so much for adding me. I've got one started like this, need to get busy and finish it!! !